So sad to learn that Cletus Anderson died last week. He built the incredible costume design program at Carnegie Mellon University, where he taught from 1968-2003, and worked on countless theater and film productions. Along with his wife, Barbara, Cletus authored the definitive textbook on costume design titled, aptly, Costume Design. Chris Lawson of the Pittsburgh Post-Gazette has a touching profile in today's edition where you can learn more about this amazing man and see samples of his work. "Cletus seemed to have a designer protege in every regional theater and every city. ... but what is really incredible is that many writers, actors and directors were touched by him. He made a difference in everybody's life, the Holly Hunters, everyone who had to come up to the costume shop or walk across the stage, he was able to send them on the right path." That is so true. I was lucky enough to have Cletus for a class called Designing for Playwrights, an overview of theatrical costume and set design. We were a handful of overworked, sleep-deprived and malnourished writers who couldn't design or draw to save our lives. Cletus was patient and encouraging because he wanted us to understand what designers do so we could better collaborate with them on future projects. He taught us not to create impossible sets and unwieldy costume changes, but he also showed us how almost any shortcoming or obstacle can become an opportunity in the hands of someone with creative spark. 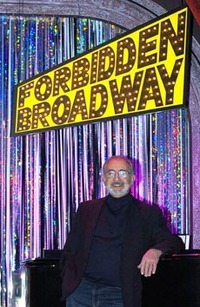 He made sure we knew the names and legacies of influential costume, set and lighting designers. Cletus was a smart and friendly guy and we learned a lot from him. Cletus was also the production designer for several George Romero movies. Here's where I really connected with him. I loved asking Cletus about these experiences and, though I'd never peg him as a fan of the genre, he loved talking about them. Sometimes my fellow classmates would get visibly frustrated at these digressions but damn it, I'm a bona fide horror film geek sitting next to the guy who'd designed some of the genre's more memorable films of the 1980s. There were days when Cletus and I just couldn't shut up about them. 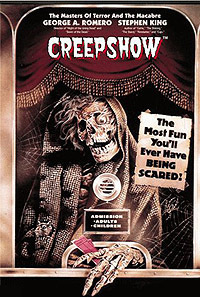 I got the scoop on Stephen King and all those creepy cockroaches from Creepshow (1981). According to Cletus, King was a great team player who'd dive in and do rewrites on the spot to save the production some money. Remember that final segment, with E.G. Marshall fighting an army of cockroaches that invades his sanctum? The original design had this anti-social character locked away in an ornate world of antiques, plush furniture and expensive rugs. The problem: this low-budget indy couldn't afford anything like that. Cletus, along with King and Romero, hammered out a low-cost alternative: make the character a germophobe living in a sterile steel-and-tile environment. This was not only cheaper to do, but far more effective aesthetically. When the nasty black and brown bugs skittered over these shiny white surfaces, the audience shared the main character's revulsion. Some of those vile hissing cockroaches escaped the set, but it's an urban myth that they went on to infest Pittsburgh. According to Cletus, who worked with the bug wrangler, they're just not designed for the climate and certainly died that winter. 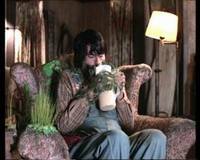 Cletus also designed the fuzzy mold-sprouting overalls that King wears as backwoods hick Jordy Verrill in the movie. When I reported that a classmate had found these overalls hanging in the costume warehouse, Cletus was greatly amused (they've since vanished, and no, I had nothing to do with that). If you watch carefully, you can catch a glimpse of Cletus and Barbara as extras during the segment where Fritz Weaver daydreams about killing his wife (Adrienne Barbeau) at an academic party. Cletus told me a lot about Romero's Day of the Dead, including the day he was almost rendered dead by an alligator on the set. Once he invited me to his office to see grand production sketches for Day that sadly were discarded when the film's budget was slashed just before shooting began. He enjoyed working on all of these low-budget movies, but I sensed that Day of the Dead was a regrettable experience because so many of his amazing designs never saw the light of day. In fact, the money was so miniscule that the story was downsized and relocated to a huge cave just outside of Pittsburgh. 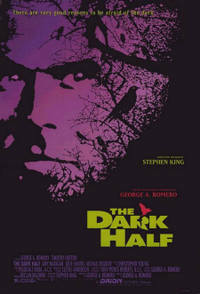 Another day, Cletus told me some of the things that went wrong with Romero's adaptation of Stephen King's The Dark Half, from the off-set craziness of some of the actors to the budget and post-production woes that plagued the project. It's a wonder this film was ever completed, let alone released. 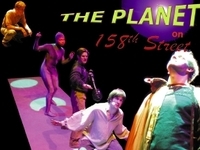 On my invitation, Cletus and Barbara were kind enough to attend my thesis play, The Planet on 158th Street, which mixes 1940s New York with a Buck Rogers-style space opera. We raided one of the few resources available to us: the immense CMU warehouse holding costumes from decades of productions. While watching the show, Barbara and Cletus nodded and whispered to each other as they recognized costumes from past shows. After the curtain, Cletus walked up to me and grinned and gave me a big hug. He didn't say anything, just let me know that he was happy for me and happy he'd seen the show. That was plenty. My anecdotal recollection of Cletus is horribly inadequate. I know there was so much more to this man, and I wish I'd known him better. My thoughts are with his family, and I know that many CMU alums -- those who studied under Cletus and knew him better as both mentor and friend -- are deeply grieving right now. It's a testament to Barbara and Cletus that many of their former students are out there doing amazing, amazing work in theater and film design. And that so many others -- actors, directors, and writers -- are carrying lessons they too learned under his tutelage. That's the legacy Cletus wanted, and one he certainly made happen.